Hey... what you know... one I actually seen! And enjoyed! You're welcome and I appreciate the comments. I've gotten behind in my reviewing...I don't have as much time to watch DVDs as before as I'm now going for dialysis 3 times a week and 2 of those days (Mondays and Wednesdays) I'm also trying to watch a full night of sitcoms (CBS on Mondays, ABC on Wednesdays). So I'll try to review more when I can. I was curious about composer Bruce Broughton and just looked him up. Prior to Silverado, he mainly did music for TV series episodes. Since then, he's done other movies but not a lot of really recognizable titles. Among the movies he did do music for were Young Sherlock Holmes, Sweet Liberty, The Boy Who Could Fly, Harry and the Hendersons, Betsy's Wedding, Stay Tuned and Lost In Space. The only notable western movie he composed music for was Tombstone. I need to see that one soon, too. The Hoppy film I watched this time is from one of several volumes put out by Platinum, each containing 5 original Hopalong Cassidy films. Besides the one I discuss below, this volume also includes Undercover Man, Three Men From Texas, Stick To Your Guns and The Dead Don't Dream. 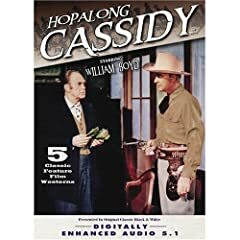 The earliest Hopalong Cassidy movies came out in 1935 and I had actually started to watch them in order that they came out but I decided to move ahead in the series so I could catch an episode with a few other familiar faces. Of course, I also had to "take a hit" with that idea as well because by 1943, Gabby Hayes had left the series and Andy Clyde had taken over the part of the "funny old geezer" role, playing a character named California at this point. The first familiar face in this short film was Robert Mitchum (billed as Bob Mitchum in the credits), playaing a bad guy as he did in most of his handful of appearances in the Hoppy films. He actuallyl winds up dead about 10 minutes into the picture but he gets it off to a quick start, gunning down a railroad man, stealing his mailbag and then being caught and finally gunned down himself. The plotline has Hoppy and his friends using their share of the reward money for capturing him and using it to become partners on a cattle ranch with a man and his sister who are already there...the man here is the other familiar face in this film, George Reeves, later to be tht title star of TV's "The Adventures of Superman". Apart from a few interesting plot twists, this is pretty much a standard Hopalong Cassidy movie which means it's got lots of gunplay, people running to the rescue on horseback and a fair smidgen of comedy relief. At the end of the tale, so we don't expect Hoppy to be stuck on his own ranch for the rest of his cinema career, we learn he's been called back to work by the law due to other outlaw concerns. Maybe that's why George Reeves didn't become a permanent member of the Hoppy cast, too. I don't think I ever seen any of the Hopalong Cassidy movies. I did always enjoy George Reeves in the Adventures of Superman series. Like most "B" westerns, I believe the Hoppy movies were aimed at the younger crowd. They were fast moving with lots of running horses and gunplay and a minimum of romantic plotlines. And they were short...most were about an hour long though I think the longest Hoppy movie ever made did manage to clock in at 82 minutes. While most of my reviews are done watching DVDs, I found this on an old VHS tape I've had for many years. This movie has doubtless found its way onto many a public domain DVD westerns collection, though, I would imagine. This was probably to be the first of a series of films where John Wayne played a character called "Singin' Sandy" and in the opening credits he is billed as "John Wayne as Singin' Sandy" but I think this was actually the only official Singin' Sandy movie ever made. In the movie, it starts off with him riding the trail on horseback...while singing...and playing a guitar...all at the same time. He finds a sheriff who has been shot in the back. He eventually comes to town where ranchers have to deal with a villain who wants to buy their ranches at dirt-cheap prices while charging them exorbitant prices for much-needed water. Singin' Sandy doesn't tell anyone who he is...it turns out he is a government agent sent to find out what is going on and help solve the situation. Not only does Sandy sing to the daughter of a rancher he encounters, but he also sings just before he plugs a bad guy. He makes the bad guy think he's helping him but it's all part of a clever plan and the bad guy ironically meets his end by drowning in newly released lakes of water. A book I have lists this movie as 58 minutes (about the average length for a "B" western back in those days) but my copy is actually a bit shorter, running only about 52-54 minutes. As with most quickie westerns of the time, the story moves along very quickly but the whole singing thing (especially since John Wayne's singing was obviously dubbed by another singer) makes the whole affair an unbelievably corny time, even for me when I'm in my "young cowpoke" guise. There's some decent photography and a nice stunt or two so it's not really that hard to take...but I definitely wouldn't call it a classic. I enjoyed seeing it again after many years so m aybe I'll look it up in another decade or so. Sounds like a decent storyline... though I don't think I could handle all that singing! Interestingly, this movie and another movie about Wyatt Earp called Tombstone both hit the big screen within a year or so of each other...maybe they both came out the same year...I'm not real sure. But becasue they were released so quickly together, many people compared them together which may be an unfortunate thing. I've yet to see the other film so I won't do that. 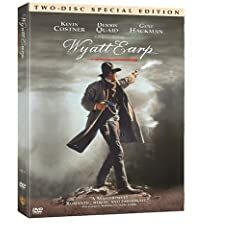 Unlike Tombstone, which I assume concentrates on one part of Wyatt Earp's career, this film (which was originally planned to be a TV mini-series and later turned into a feature film when director Kasdan came aboard. Perhaps the span was too great for one film...it certainly is a long one, beginning when WSyatt was a teenager and ending a bit after the infamous Gunfight at the O.K. Corral (with a tacked-on finale with Wyatt in his later years following the Alaskan Gold Rush. This film stars Kevin Costner as Wyatt with a terrific performance by Dennis Quaid as Doc Holiday who lost a lot of weight t play the ill doctor who was suffering from tuberculosis. There's a lot of familiar names in this film from Isabella Rosselini (as Big-Nose Kate) to Tom Skerritt. It's got some great photography and a great score and I can't complain about the direction. But I do think the film is a bit long and includes perhaps too much. Among the extras, in fact, are even more scenes that didn't make the final cut...here they call them "lifted" rather than deleted scenes for some reason. There are also some other extras including a documentary and TV special. My one gripe about the DVD is they divide the movie over 2 discs...at one point you have to take Disc 1 out and put in Disc 2 to continue watching the film. But while I do think the film includes too wide a sweep, I must say I actually enjoyed it more than I thought I would since I had read a few not-so-great reviews of this film. This isn't the best Wyatt Earp film around but I did enjoy it. I love this film, though I do I realise it's a long one! Mind you, Dances With Wolves is my absolute favourite film of all, so I obviously don't mind Costner taking his time... I just like the rather lyrical approach to the story and it looks fantastic. Tombstone is more fun, but I think this has more substance and quality. Everyone talks about Val Kilmer as Holliday and he is superb, but again, Quaid I find stunning in the role. Still, neither of them have exactly built on it so all's fair! The two films were a year apart. Costner was working on Tombstone, but disagreed about the direction, so worked with Lawrence Kasdan to develop what he thought was the right way to do it. To both films credit, they are quite different. Thanks for the review, Roger. I know you're finding it tough, so take care. This picture was started by Howard Hawks...who producer Howard Hughes had some difficulties with...so Hawks went off to direct Sergeant York and Hughes took over the directing himself (though screenwriter Jules Furthman often subbed for Hughes so we're not sure how much of the film Hughes actually directed). It is another of the many films about Billy the Kid with Billy played by Jack Beutel (a virtual unknown save for this picture) with his girlfriend played by Jane Russell. Thomas Mitchell portrays Pat Garrett and they even throw in Doc Holiday (played here by Walter Huston) and while Doc is indeed a gambler, he shows no signs of sickness for which was a real problem for him...he doesn't cough once in this picture! The story begins with Doc's arrival in town where he meets up with his old friend Pat Garrett...and then Billy quickly shows up as well and Doc quickly becomes friends with Billy and thus becomes an enemy to lawman Garrett. This is not really a great western...Thomas Mitchell doesn't really have the stature to be a western hero and he is not particularly a noble person in this film. Much of the photography centers on the voluptuous Russell, sometimes to nearly comical effect (at least when viewed in this century). But the film is lively and never boring. I liked Beutel's performance so it's disappointing his career never really amounted to much. The photography is good (even during some obvious process shots) and the plot moves along brisquely. I have the Roan edition of this...the print is first-rate with very clear sound. This DVD only has one extra, the movie trailer though the quality of the coming attraction isn't nearly as good-looking as the film itself. I would say if you're looking for one of the great westerns, this isn't it...but if you just want to watch a fun western, you can do worse than The Outlaw. Good to see you reviewing again Roger! Thanks, Pete. I'm going to try to get back into the habit of doing them again (my last review was in December). I was torn yesterday between the one I did and a Clint Eastwood western. I may do the Eastwood one I was thinking of next...perhaps tomorrow. I've been meaning to see The Outlaw for a long time, ever since I did research into the production code. For one reason or another, I've just never gotten around to seeing it. I'll definitely be adding it to my list for summer viewing once I graduate.